Awesome press release written by Jay, ASIFA-Atlanta secretary! Flyer by John Cason! ATLANTA, GA - ASIFA-Atlanta, in association with Eyedrum, is proud to present its first annual ASIFA-Atlanta Art Show. In keeping with the spirit of ASIFA, the collection of work by its members is inspired by the Golden Age of Comics and Cartoons. There promises to be an exceptional display of character driven and humorous pieces that is indicative of the work being produced by Atlanta's animation community. The collection will feature contributions from over three dozen artists. (A partial list of artists is attached below.) The majority of pieces displayed will also be available for sale. Saturdays and Sundays (1:00pm - 6:00pm), through December 28th. 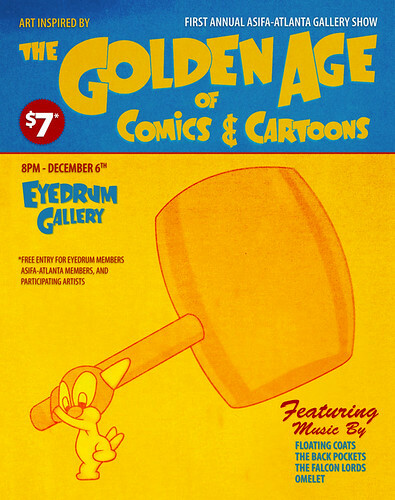 Established in 1998, Eyedrum is a non-profit organization developing an interdisciplinary approach to the arts by incorporating a wide range of contemporary art, music and new media in its gallery space.